Mongolia has been a country on our “must visit” list for as long as we can remember. For years we have hankered after views of vast open landscapes, soaring eagles and for a taste of the nomadic way of life. Months of preparation, six weeks of driving and 14,000 kilometres led us to this point. Finally, it was time to enter Mongolia. Or was it? As we queued up at passport control at the Mongolian border crossing, it seemed there was a problem with our visas. We still aren’t sure exactly what sort of problem, but it had something to do with the dates (which we knew were fine). After a lot of toing and froing (and waiting – mostly waiting), our passports and visas were returned to us… with the date crossed out, and a new date written in its place. This was a bit weird, but didn’t matter to us. What did matter was the delay this had caused. It was 5pm and the border was closing for the day. We had limited time to get through the customs process if we wanted to avoid a night in the border compound and to try to catch up with our Kiwi friends. Luckily there was no one else around, and the border officials were in just as much of a hurry to get us processed and out of there as we were to get into Mongolia. Except, at the final hurdle, there was a problem with the computer. We couldn’t be processed. I was told that we would have to come back tomorrow. “We can’t come back tomorrow”, I replied. It wasn’t a lie. We couldn’t leave and go back to Russia – we had been stamped out. We would have to wait exactly where we were, even if that meant waiting until the following morning. I stood outside the customs office and waited. And waited. And waited. And looked a bit sad. Eventually, the border officials seemed to a) realise we weren’t going to leave (there was nowhere we could go), and b) feel a bit sorry for us. They started making some phone calls, and actually started to try and get the computers to work. All of a sudden, the computer worked again and the final bit of the bureaucracy jigsaw puzzle could be completed. We were in. We found the Kiwi team waiting for us just on the other side of the border compound. Thankfully they hadn’t given up hoping that we would make it through before the end of the day, and we all drove together on the first section of bad road from the border crossing to the small town of Tsagaannuur. As soon as we pulled into town, we met a local man on a motorbike. He wanted us to stay in his hotel for the night, and promised that for just $5 per person we could enjoy a comfortable night’s stay and a delicious yak-based meal. It sounded too good to be true, and in some ways, it was. The hotel was his family’s house. There was one room where we could all sleep on the floor. The yak meal was… lacking in yak meat. But, before we could eat and rest, the men were needed to help with a little job. Another Mongol Rally car had got stuck between the town and the border, somewhere off road. Shane, Mike and Nick went off on a local truck to perform a rescue operation. The truck didn’t have enough petrol, so they stopped to get petrol. Then the truck over heated, so they stopped by a lake to put water in it. Then, they were asked to lift the car onto the truck, but even though they are all very, very strong, this was impossible. Instead they found a way of pushing the car onto a bank, and then onto the truck. And then the truck broke down again. By the time they returned it was very dark, very cold and they were glad of the warm stove back at our “hotel”. A night of vodka drinking and musical instrument playing ensued, and then we all fell sound asleep. Over the next two days we drove around 700km, sometimes on dirt and gravel tracks, and sometimes on smooth tarmac. 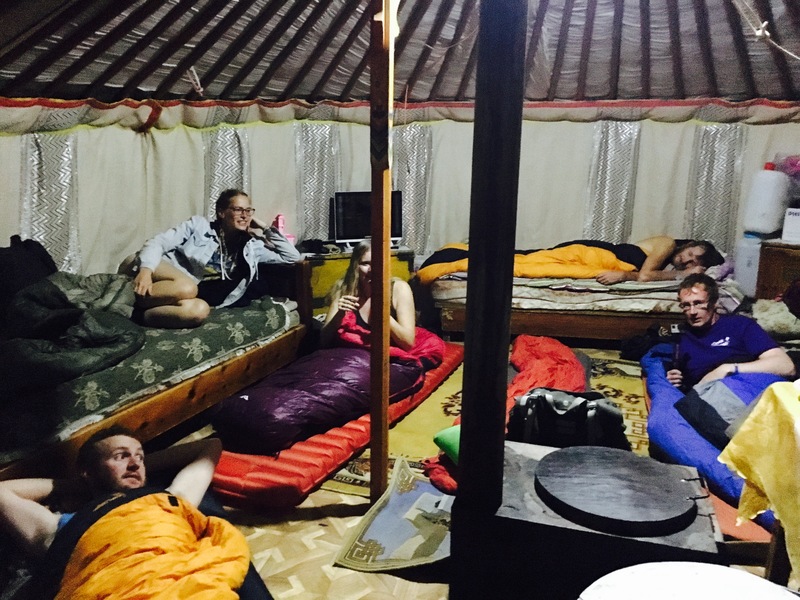 We passed through the towns of Olgii, Khovd and Altai, and camped by some yurts and then in the wild Mongolian desert, where we were joined by team Fiat to Believe it and team Mongolia Independent Trading Co. The next day was the big day. 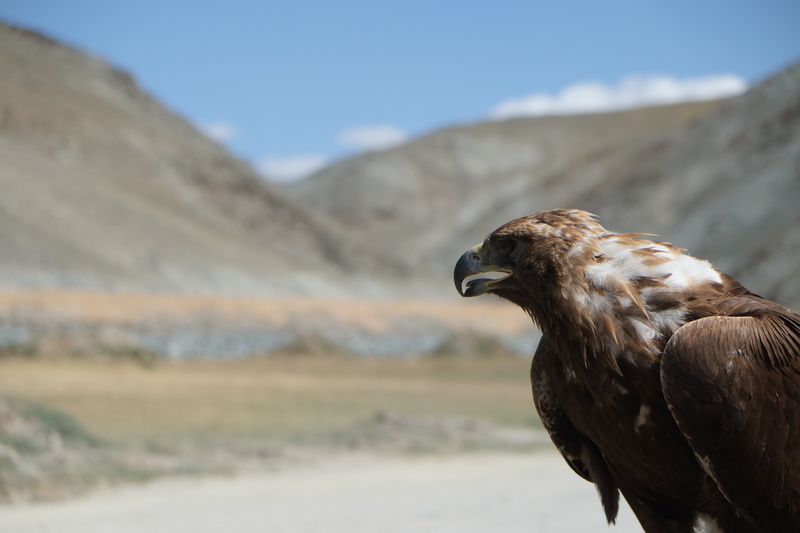 We knew that from Altai to the next big town of Bayankhongor there were no roads. For 270km we would have to drive Martha off-road. 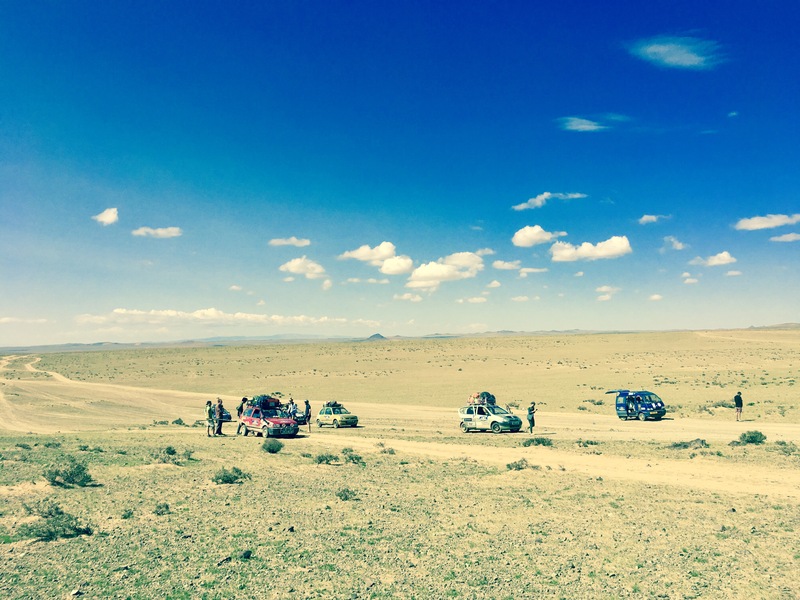 We had heard rumours from other teams that this was the worst stretch of the entire Mongol Rally. It had claimed the lives of many perfectly healthy and happy cars. Martha had been perfect so far, but we knew that she could die at any time. We resolved to stick together as a convoy of four cars, and set off on what we assumed would be the hardest, scariest and most adventurous part of our whole journey. What we found was altogether quite different. Shane did the majority of the off-road driving, and he loved it. Martha also loved it. Even I loved it. We had been planning to go very slowly, but quickly discovered there was no need. Martha loved driving as fast as she could. We sprinted with the other cars. We (deliberately) slid and skidded around. We reached speeds of 100km per hour on the dusty tracks. This wasn’t the worst road of the rally at all – in fact, it was the best road! The fun we were having was tempered by our encounters with other teams. We met two teams convoying together who seemed to be having big problems (both car related and team dynamic related). Then we met a team parked in a very small town who’s engine had collapsed and was irreparable. Just like Martha, their car had been perfect every step of the way so far. Just like us, they hadn’t even had a flat tyre. But now, they had hit a bump, and their car was completely dead. 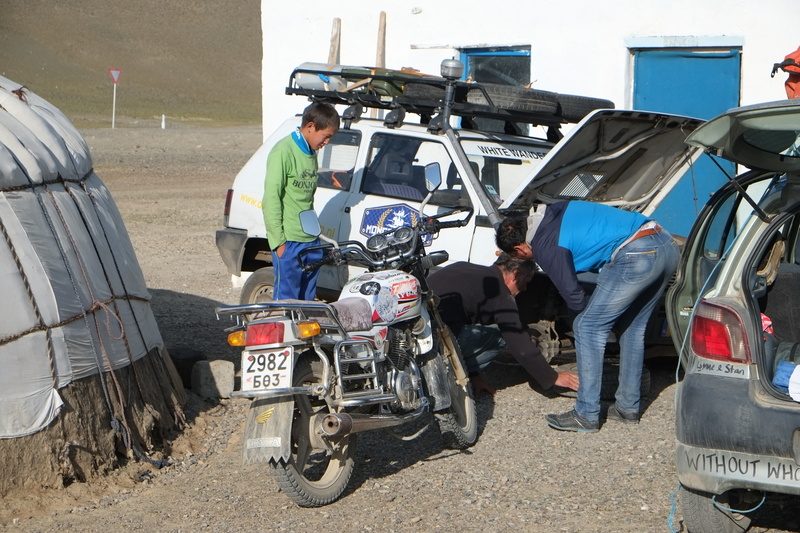 They were having to arrange a tow truck to take them to Ulaanbaatar at a cost of $600, and then would need to make other arrangements to get the car out of Mongolia. It was a stark and sad reminder that things could go very badly wrong at anytime. But Martha continued to drive happily through Mongolia. It felt like she was made for off-road racing. She had reached her goal, and so had we. 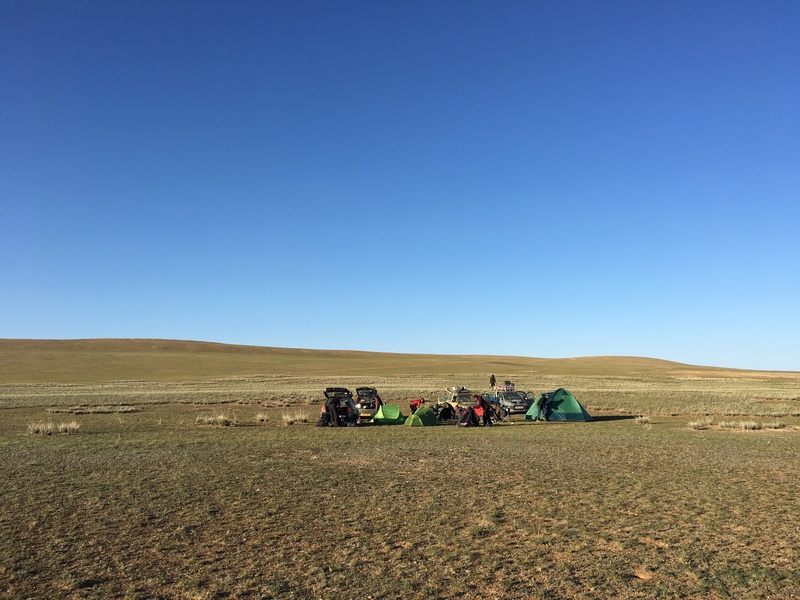 As darkness fell, we pulled off the road with the three other teams and camped in the Mongolian desert again. 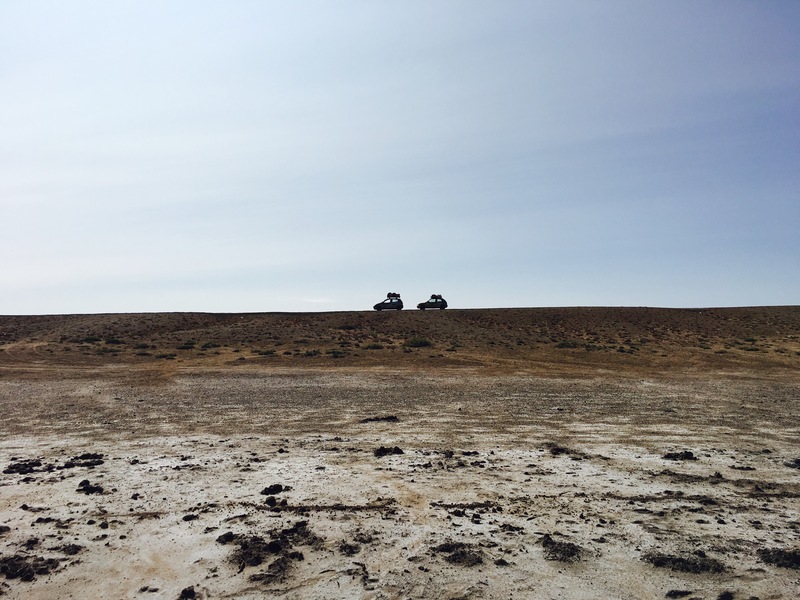 As Mongolia is the least densely populated country in the world, we didn’t have to try too hard to find a spare bit of space! The next morning we had a decision to make: try and get to Ulaanbaatar as quickly as possible, or detour for a bit more off-road fun and some sight seeing. 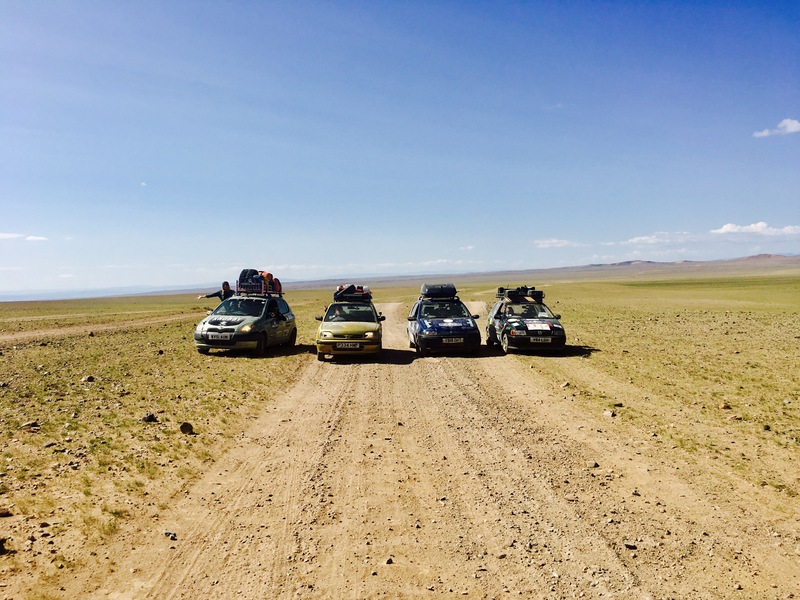 Team Fiat to Believe it had a rapidly expiring visa so had to head straight to Ulaanbaatar, but the rest of us opted for a slower pace and some more exploring. 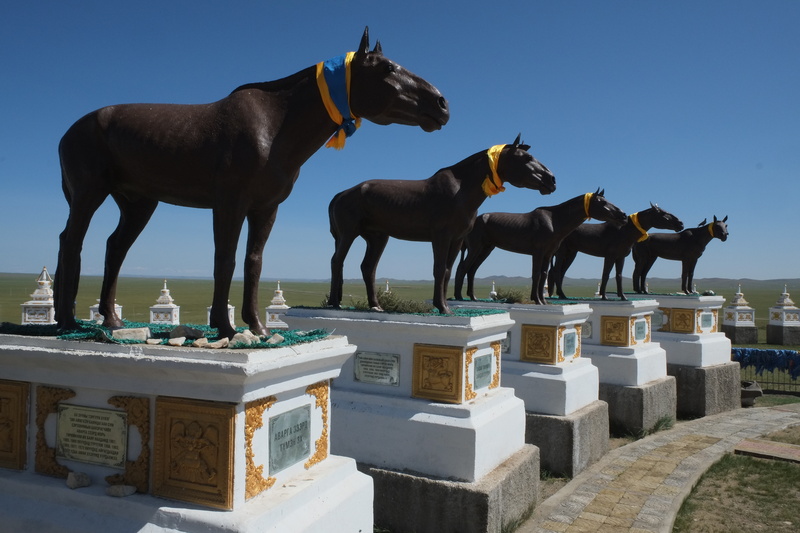 Our first stop was a very strange horse shrine just off the main road. There were lots of statues of horses and horse skulls, but no explanation. We still have no idea what it was all about, but it made for an interesting stop. Next we ventured off-road looking for some hot springs. After taking a few different tracks, stopping to ask for directions at a village (where Shane did a hilarious mime of bathing in a hot spring), and driving back on ourselves again, we found a strange holiday resort with a small pool of hot water. As this was day six without a shower for all of us, it didn’t take much time or much persuading for us to hop out of our dirty clothes and into the warm water. All was well. Then we noticed that Jamie from the Independent Mongolian Trading Co. had disappeared. When he returned, it was with an interesting story. Some nearby locals had insisted he visit their house to see their dead Marmot, drink their horse’s milk and watch Titanic (unfortunately, not in English). Thankfully, we didn’t miss out, as the same locals followed him back to the pool and insisted we all drink the horse milk and come to visit the dead Marmot when we were finished in the hot spring. It was a fun afternoon. After a bit more driving, we pulled over near some yurts in search of a place to stay. 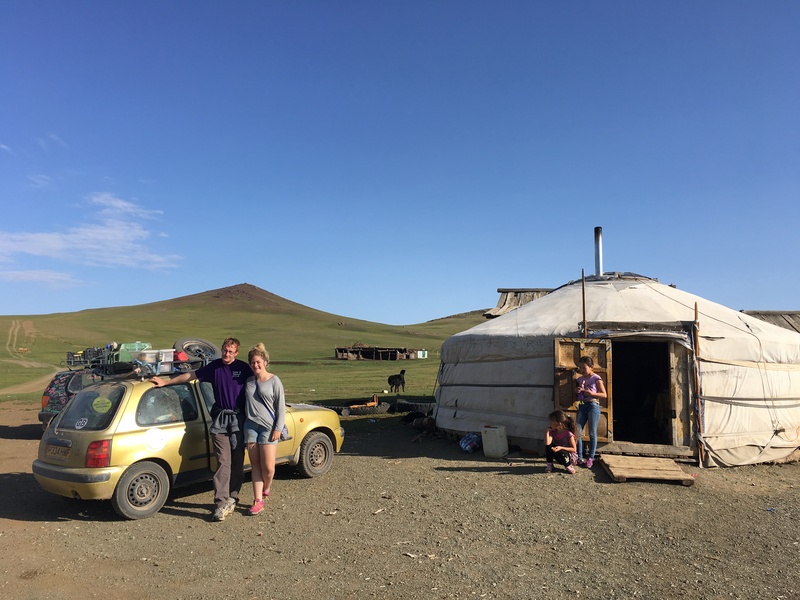 One woman invited us to stay in her yurt with her and her two daughters for a small fee, and made us a very large meal of goat, noodles and potato. As we ate and warmed ourselves by the fire, she then proceeded to tell us the story (several times) of how her eldest daughter was conceived. Despite the language barrier, her detailed mimes gave us a good idea of what had happened. Approximately nine years and nine months ago, a man called Michael had come to visit, stayed with her for two nights, got her pregnant, and then flew back to Germany and left her. He may also have visited Paris. We don’t know whether Michael is aware he has a daughter in the middle of Mongolia, but if anyone knows a Michael (probably from Germany), who visited Mongolia nine years and nine months ago, there is an angry woman looking for him. 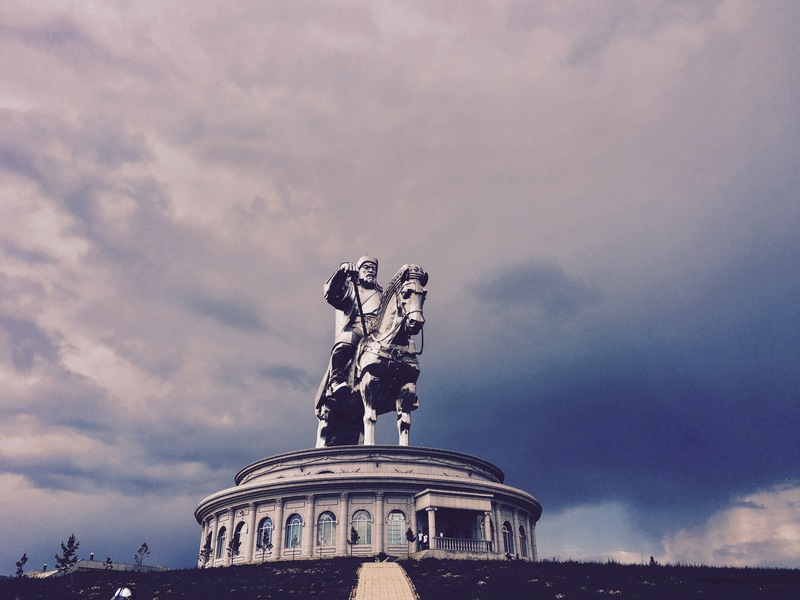 On our sixth day in Mongolia, we finally made it to the capital – Ulaanbaatar. Driving into a big city after days of empty desert was a surreal experience. Almost half of all the people who live in Mongolia live in Ulaanbaatar, and as the traffic was so bad it took us about half an hour to drive about 500 metres in the city centre, we could tell. 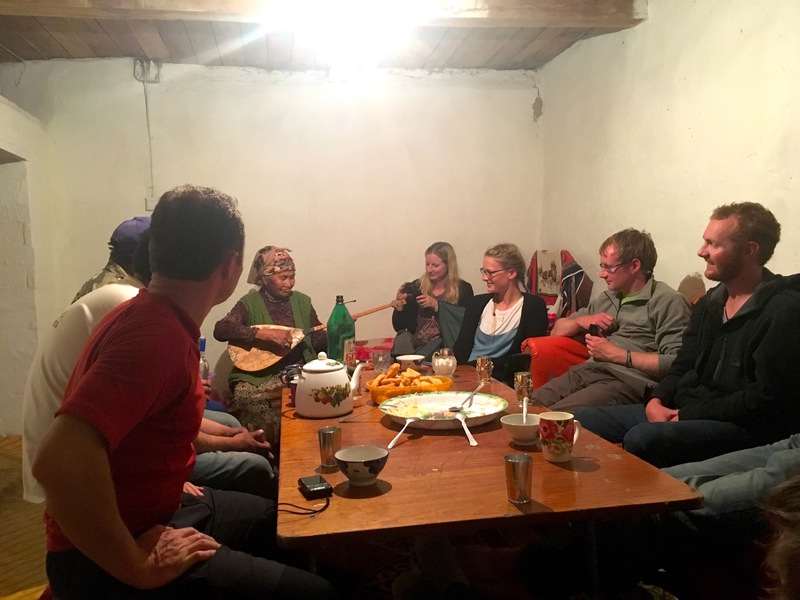 It didn’t take long for us to find the nearest Irish pub where we met with another Mongol Rally team, and some of us indulged in a few celebratory beverages. 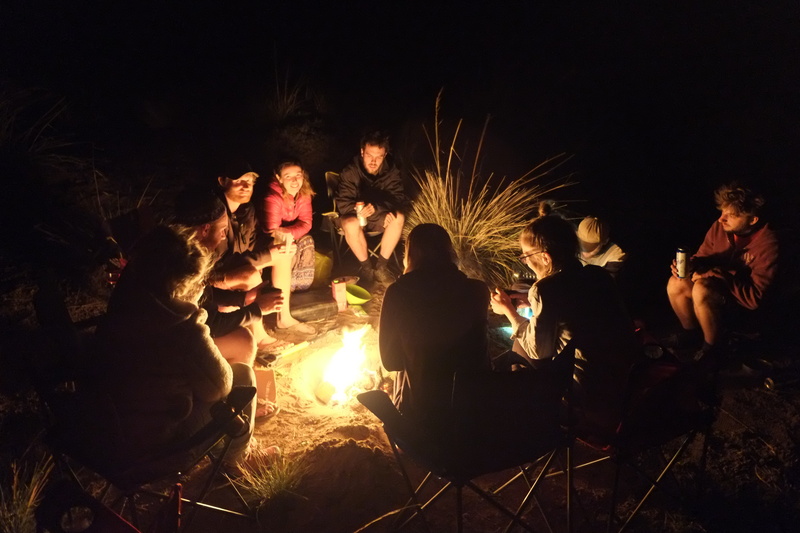 This quickly descended into chaos, and by the next morning there were three lost phones, a lost passport and a lost wallet. Thankfully, Shane and I managed to keep hold of all of our belongings. We decided to stay for a few days in Ulaanbaatar. We wanted a rest in a real bed, a hot shower and to see some of the sights. First on the list was the Central Museum of Mongolian Dinosaurs. Mongolia was a hotspot for dinosaurs back in dino-times, and it was great to see the bones of some really weird dinosaurs that we have never seen before. Next we went to visit a giant statue of Genghis Khan. Despite the fact that he is responsible for an estimated 40 million deaths, Genghis Khan is considered to be a national hero in Mongolia for uniting the Mongolian nomadic tribes and founding the Mongol Empire. It was an interesting but quiet day at the statue: the complex was built with thousands of daily visitors in mind, but we saw only a handful of people. At the Genghis Khan statue we waved goodbye to team Kiwis Crossing. 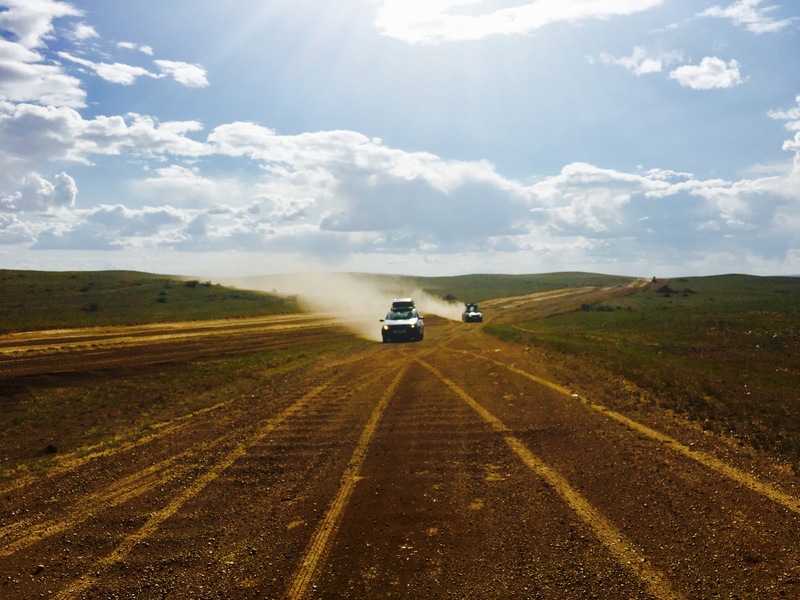 After a week of convoying together through Mongolia, the Kiwis were heading straight up to Ulan Ude to officially complete the rally, while we planned to stay in Ulaanbaatar for a little longer. As we come towards the end of our time in Mongolia, Shane and I have mixed emotions. We are very relieved that Martha has made it this far and didn’t die in the middle of the Mongolian wilderness. We have had a great experience driving through the country and it has been as impressive and interesting as we could have hoped for. 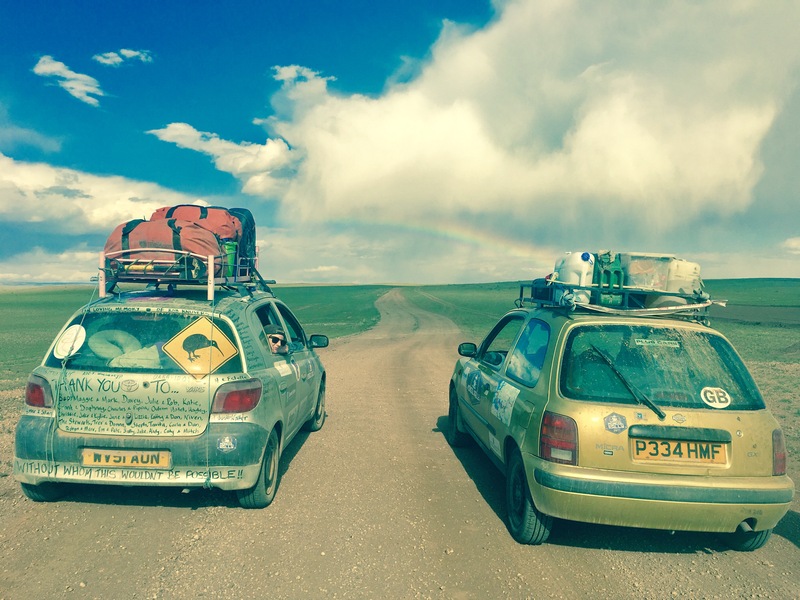 We can’t believe it’s nearly time to say goodbye to Mongolia, goodbye to the Mongol Rally and goodbye to Martha. In just a few more days we will drive back into Russia and, all being well, we will cross the final finish line.